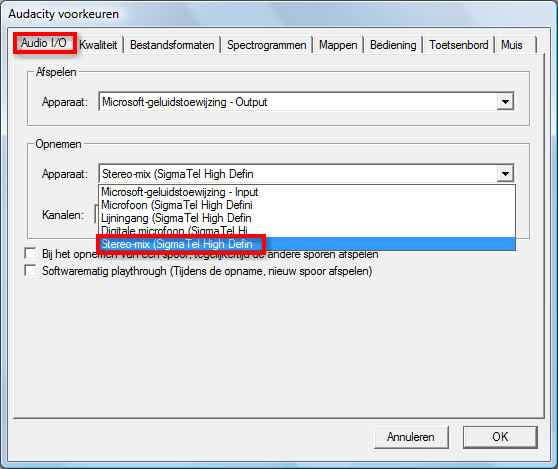 Audacity & Vista: stereo-mix gone? 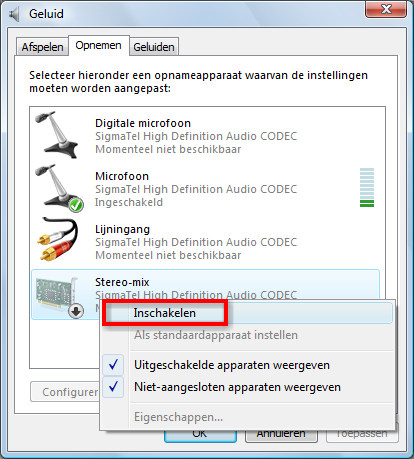 If you are one of the many fans of Audacity, the much praised open source audio software, and you happen to have made the switch-voluntarily or not- to Vista, then maybe you have experienced some problems. 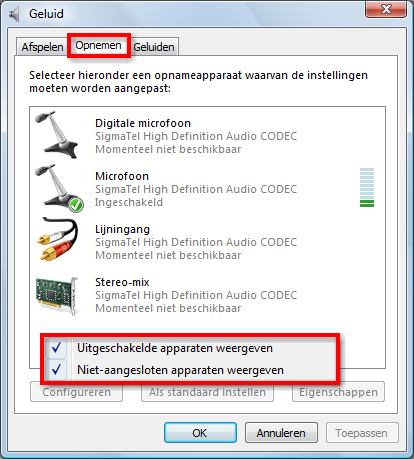 Is audio recording in Audacity under XP fairly simple & straightforward a matter of selecting wave-out, stereo-mix, mono-mix or a similar recording device, in Vista this is unfortunately no longer the case, as you probably have experienced -otherwise you wouldn’t be reading this blog post now, would you? Don’t blame Audacity, however: Microsoft’s DRM (Digital Rights Management) is the leading villain character in this play. It all boils down to the fact that you can no longer simply record anything of your liking: wave-out doesn’t even appear among your recording devices. Is there really no work-around? Well, there is, but it’s perhaps best not to cry victory yet. The silly thing is that, in spite of it not being visible, quite often wave-out is still a functional recording device; it is Vista that arrogantly hides it from its recording device panel. Now, to change its status so that stereo-mix does appear in that list, here’s what you can try. By the way, screenshots are from a Dutch Vista system -sorry for that, but I’m sure you’ll get the idea. Go to Sound in the Control Panel’s classic view and select the Recording tab. Click somewhere in the empty space in the central list pane (where the other recording devices appear) or right-click any of the devices listed. Make sure that “Show Disabled Devices” and “Show Disconnected Devices” are checked. Stereo Mix should show up (or mono-mix, whatuhear, or something similar). If you’re lucky, this may already do it for you. Right-click on stereo-mix and set it as default. Open an Audacity project. The dropdown menu with recording devices will still be grayed out, but via Edit > Preferences you can select stereo-mix. Sweet. If you’re not so lucky (owners of a Sigmatel audiocard know what I’m talking about), then here’s something else you can try. Go and find the XP-drivers for your audiocard. But I don’t have XP, I’m using Vista! Yes, I know, but just follow along. If you don’t know which audiocard you have in your system, then open up the control panel and choose System > Hardware > Device manager. You’ll find what you need under Audio, video & game settings. Google the name of your audiocard, and combine your search with download XP drivers or something similar and no doubt you’ll quickly find what you need. Now here’s the trick: install the drivers in compatibility mode. This is how you proceed: open up an explorer (not Internet Explorer! ), navigate to the drivers you just downloaded, right-click on them and choose Properties. 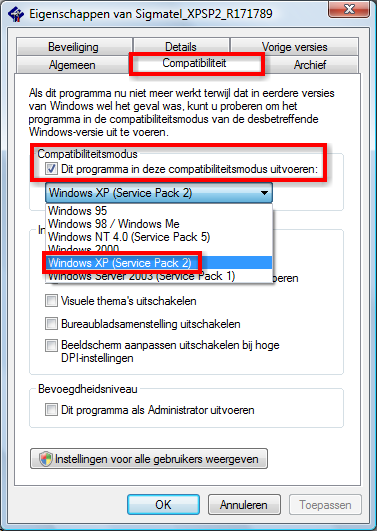 In the compatibility tab, choose Windows XP-SP2 in the pulldown. Confirm via Ok. In explorer double-click the drivers to start installing them -reboot if necessary. Cross your fingers a go and check your audio devices. I have exactly the same problem,ie only line in and microphone on XP I don’t have the option of showing disabled items. –but idk where to look…HELP? Thank you so much! You saved my life! Making podcasts without this function is not fun! The problem with those XP drivers is that they stop working now and then. Suddenly I get repeated crackling sound from any audio application, and only rebooting seems to help. This is under Windows 7 RC though, have not tried Vista. Thanks a bunch for this excellent write up. It certainly helped me great deal. Thank you so much!!! You’re amazing! Not free, but you can select Speakers input instead Stereo Mix. This was so helpful. I used Audacity on my Windows 2000, but it didn’t work with Vista. This was incredibly useful. P.S. The Dutch screenshots were awesome. Thank you, thank you, thank you – It was all double Dutch to me till I read your blog (sorry bad joke). I would never have figured out how to get stereo mix back without this blog and for me its the final nail in Windows coffin – Mac here I come.